The following sections provide more information on some of the little understood side effects of tongue tie. On first observing a neonate with tongue tie, the cosmetic appearance of the tongue and the tie will stand out. The tongue may look small, rounded and indented in the midline with a heart-shaped look. If the frenum does not reach the lingual margin this typical heart shape may not be apparent, although function of the tongue may still be significantly impaired. As the child grows older, the appearance changes and the tongue may look square, or bifid, or thickened and too large for the mouth, so that it curls up at the sides. The tie itself can vary from a thin elastic membrane to a thickened, white non-elastic tissue. The tie or frenum may extend to the lingual margin causing notching, or spread along the floor of the mouth in a fan shape reaching towards the incisors and causing discomfort or actual pain on activity. Salivary profusion due to inadequate coordination of swallowing during speech becomes both visually and auditorily obvious. Habits of mouth breathing, aerophagia and forward tongue position become entrenched, and are easily noticed and less excused in the teenager or adult person. The appearance of both the tie and the tongue generally becomes more conspicuous and even ugly, as the child grows older. ‘Failure to thrive’ is the term used to describe babies who have poor weight gain, are fretful and difficult to settle. A baby who does not feed well is likely to fall into this category. Breastfeeding is an opportunity for a calm and satisfied baby to interact with the mother in a way that builds a strong bond between them. Repeated difficulties at this time can interrupt or delay bonding. Sleep deprivation will affect both mother and baby. A baby tired by unsuccessful sucking efforts will fall asleep on the breast and later awake unsatisfied, thus prolonging the feed time without fully satisfying the hunger. Bottle feeding is often commenced when there is a tongue tie – whether with expressed breast milk or formula. Lactation consultants maintain that the need to resort to bottle feeding may have significant negative consequences. They maintain that none of the wide range of bottles and teats available and promoted as being “as good as the breast” fulfils their promise. Further, the sucking patterns required for breastfeeding are different from those used when bottle feeding and can have an undesirable e3ffect on the skeletal structure of the palate. Bottle feeding requires strong piston-like up and down movements of the tongue to compress the teat. This can cause a high, narrow, arched hard palate, and sometimes encourage a tongue thrust swallow, if the baby uses the tongue as a ‘stop’ to cut down the flow of milk from a teat with a larger hole. Breastfeeding has the advantage of allowing the soft and hard palates to be moulded into a gentle curve, because the malleable breast tissue distributes pressure over the whole of the palatal region. Loss or reduction of milk supply due to incorrect sucking movements occurs often, so that bottle feeding may be introduced earlier than planned. Formula feeds deprive the baby of sharing maternal immunity from infections in early life. Problems experienced at this time can cause a weakening in the bonding process when the baby becomes frustrated by unsatisfying attempts to feed, and the mother becomes depressed by what she feels to be a failing on her part. Bottle feeding may sometimes have a negative impact on dental health. Difficulties can also be experienced when attempting to introduce solids. 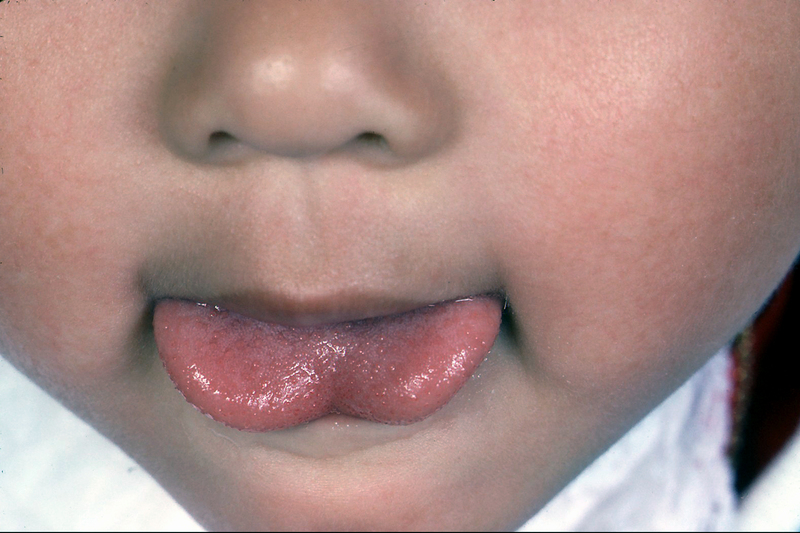 The tongue-tied baby will quickly develop strong habits of oromuscular movement, all influenced by his inability to move his tongue correctly. Thus, accepting the solid food by opening the mouth widely enough to receive the spoon can be affected by a habit of inadequate mouth opening (see breastfeeding), the tongue may not protrude over the gum ridge, instead it will hump at the back of the mouth and push the food out rather than draw it in. Pureed or solid food must be transferred to the middle, then to the back of the mouth prior to swallowing. The food has to be collected by the tongue into a more compact mass (bolus) so that it all goes down into the oesophagus and is not allowed to be diverted into air passages and cause choking. 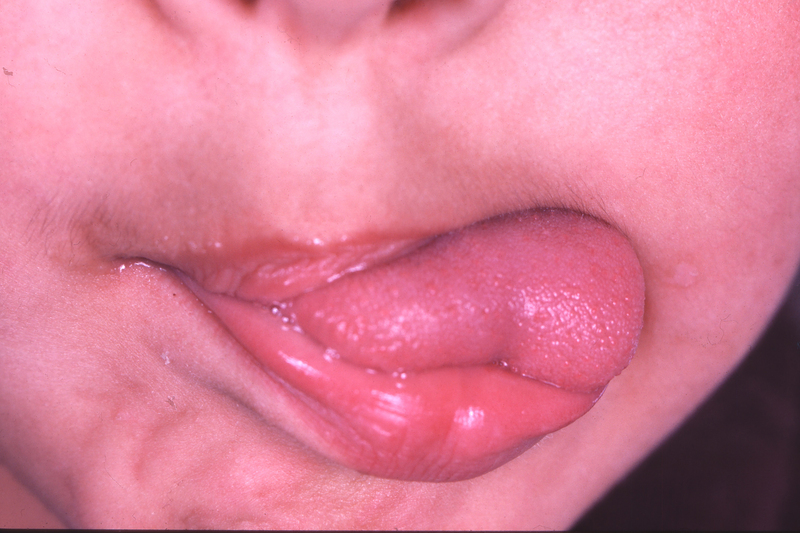 A tied tongue may have difficulty in performing the movements needed for dealing with solid food; thus, lateral (sideways) movements of the tongue are often difficult or impossible, tongue protrusion and elevation for accepting food or licking may also be affected. Time and practice will be needed to learn the movements for dealing with solids, which are different from those used in sucking both on breast and bottle unless the frenum is revised. When the baby progresses to firmer food requiring chewing, and the bolus of food needs to be moved from side to side, to assist mastication by the jaws, many children with tongue tie will reject food that is difficult to chew, or move it around their mouths with their fingers. Dealing with a variety of solids of different textures may also prove difficult. Habitual gagging, coughing, choking or vomiting is frequently caused by inadequate tongue mobility and coordination while eating. Such children often continue to be slow picky eaters or fast untidy eaters who chew inadequately, prefer soft foods or suffer the results of aerophagia – swallowing air while they eat. An inability to clear food off the teeth and lips with the tongue is common, and even adults with tongue tie may continue to be unable to chew meat, or masticate bulky mouthfuls. Adults, though rarely undernourished, are thus often significantly limited in their range of acceptable foods, which can be a social handicap. Poor oral and dental hygiene because of limitations in lingual mobility or habitual incorrect tongue posture usually accompany messy eating habits, with food debris remaining on teeth and lips, and causing dental caries. Commonly, salivary profusion is dealt with by the patient in different ways. Whereas the younger child may dribble profusely, older patients will mal-adapt, keeping the oral aperture small during speech, reducing the length of utterances or slurping loudly. Involuntary splashing of saliva during speech occurs frequently and embarrassingly. Under-developed oral kinaesthesia is the result of individuals with a tongue tie having a very poor sense of the geography of the mouth, because they have such a limited range of lingual movements. Speech problems occur which are difficult to correct by conventional means because they cannot memorize the correct movements of speech, or be sure of always achieving them. Adults develop methods of speech which mask their difficulties with sounds. Both adults and children often try to speak with a small oral aperture, so that they can make the lingual contacts required for pronouncing consonants; others speak slowly, softly or loudly. 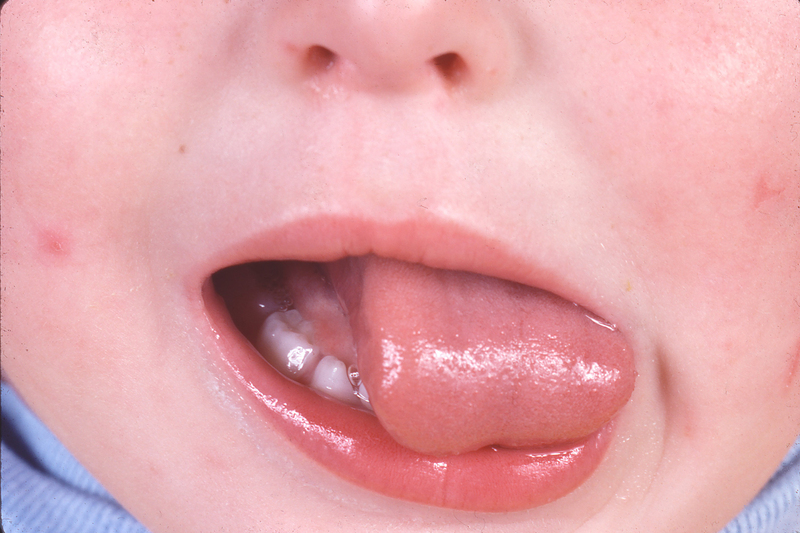 Nearly all patients past toddler stage are aware of the movements their tongue cannot make. Clarity in rapid speech is almost always impossible for a tongue-tied person to achieve. The movements that tongue tie renders difficult may vary from patient to patient but some movements – such as lingual elevation to the upper teeth and horizontal lingual protrusion – are consistently difficult or impossible to achieve because of the pull of the tight lingual frenum on the floor of the mouth and on the tongue. Other movements (whether articulatory or unrelated to speech) can only be achieved under optimal conditions: during careful speech, after prolonged speech therapy, when concentrating, and when talking slowly. Thus it is seen that many with tongue tie learn to compensate for their limited tongue mobility by adopting alterations of movements. These are rarely successful since they are often conspicuous or inefficient. The cumulative effect of these barriers in the way of normal development all too often has negative repercussions on self esteem and confidence and emotional or behavioural problems soon follow, complicating diagnosis especially in children. Mukai, Mukai & Asaoka (1993) have summed it up thus: “Tongue tie patients live in a state of stress”. Once past infancy, our interactions with people are increasingly verbal; indeed, some people once out of school hardly read or write at any length. They interact through speech and body language. It hardly needs to be stressed that if our verbal messages are not received and understood, we can become isolated from our fellows or overly dependent on interpreters. Both children and adults can then lack self confidence, and sometimes, fail to achieve the success that brings financial and social comfort. Parents who blame the tongue tie primarily for the child’s feeding or speech problems are no longer thought to be either neurotic or fooling themselves. Gratifyingly, there are now many professionals who have acknowledged that a structural defect, causing a range of difficulties, is best served by what a prominent Australian paediatric surgeon Dr Martin Glasson has described as “an operation which is simple, brief and virtually devoid of complications”. The tongue tie picture is seen to cause many more side effects than those expected, some problems being more or less important than others. These little known side effects of tongue tie can and do occur, and contribute both to a poor prognosis in therapy, and to a long term reduction in the quality of life of the patient. It is being increasingly accepted by disciplines associated with infants, children and adults with tongue tie that there is now no place for ‘wait and see’ policies when the frenum has been identified and diagnosed as abnormal, and early intervention is the optimal form of management.